Sri Chandra Advertising is one of the leading Advertising Agency in Hyderabad. We are the Advertising Agency in Hyderabad providing advertising services in Print Media & Electronic Media.We have good relations with all the news publications in hyderabad. Sri Chandra Advertising Agency in Hyderabad is providing Advertising services with regional news papers like Eeenadu, Vartha, Saakshi, Namaste Telangana, Deccan Chronicle, Times Of India, The Hindu etc. 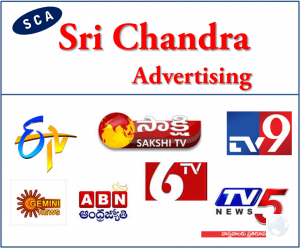 Sri Chandra Advertising Agency in Hyderabad can help you in promoting your advertisements in the electronic media like the all the Telugu News Channels like Saakshi, V6, TV9, ETV, Gemini, Maa etc. We are the Advertising Agency in Hyderabad who has good experience in successfully executing the Print & Electronic Media campaigns for our customers. With a successful track record we are able to achieve the campaign with utmost visibility for the customers products & services. Mobile: 9502230091 / 9849307932 .